Although the modern weather station console can display a varied set of readings, it is difficult to overstate the advantages from linking your weather station to a PC and experiencing the resulting power and flexibility in using the stored weather data. For anyone with access to a PC (or other computer), a data logging/software package has to be the number one accessory for your Vantage Vue or VP2 station. Impressive graphics plus comprehensive data storage and analytical features genuinely add a new dimension to the power, usefulness and enjoyment of the station. And automatic uploads to your own live weather website add further interest (see example right). We’re going to use the Davis Weatherlink software as an example to illustrate the range of extra features that PC-linking makes possible, apart from any other consideration a free copy of the Weatherlink program is provided free with every logger. But there is a wide choice of alternative software such as Cumulus and Weather Display — see the short section at the foot of this page on Weatherlink vs other software packages. Miniature computers of various kinds such as the Raspberry Pi and MeteoBridge can also be used in place of the more familiar standard PC or laptop – these options are described in the Choosing a Weather PC topic. Each of these software capabilities is discussed further below. A backstage feature, but a crucially important one: The Weatherlink software maintains a permanent, detailed, hard-disk archive of all weather data logged by Weatherlink since the system was first switched on, organised into separate monthly files for ease of backup and scaling. This archival database provides the data for all retrospective analyses and graphs and, over time, becomes a vital and immensely detailed library of all your local weather records. Any day’s data – potentially years after the event – can be called up from the database and reviewed in detail. All of the weather data in the archive database is available for detailed inspection, either record by record in the text-based Browse mode or, as shown here, with the aid of the powerful Plot mode. Any combination of the logged data values can be shown plotted together over time-spans of hours, weeks, months etc. Here we see an excerpt (title, key etc are normally visible) showing maximum wind speed (left axis – mph – red); rainfall (right axis – inches – blue bars) and pressure pattern (black) for the month of March 2004 at our base. A range of periodic (eg monthly and yearly) text-based reports and summaries can be created, with appropriate statistical analyses. This reduced-size extract shows day-by-day temperature, rainfall and wind data for the first 10 days of March 2004. Highs and low values for each parameter are shown, where relevant, along with times of occurrence. Various related indices such as the ‘growing degree days’ value used in agriculture may readily be calculated also. Built into the Weatherlink software are all the features needed for running your own, automatically-updating, weather reporting website on the Internet, which can be viewed by anyone around the world. But don’t overlook the fact that webpages are just as effective for distributing current weather data around a local area network and, for example, allowing a number of different people in the same building to view the latest weather data. Setting up the website is straightforward for anyone with a modest familiarity with Windows software. You can choose from a range of pre-designed web page layouts, or design your own layout and include just those weather readings and graphs you wish. Read more about setting up a Weatherlink website. 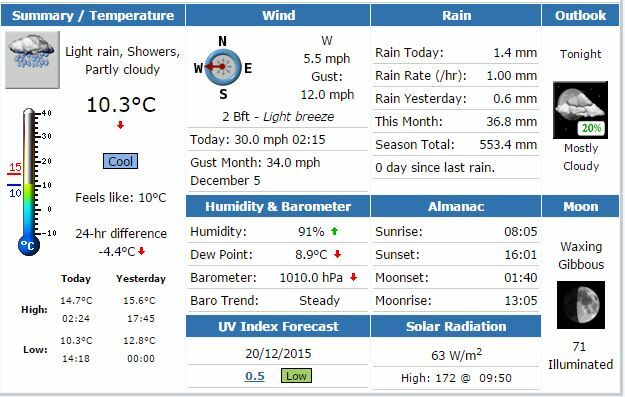 As you can see, the Weatherlink software provides a great many features to analyse and to present the weather data. But with such a wealth of detailed data available, sometimes users prefer to perform analyses in their own unique way or may have a specialist use for the data not covered by the standard software packages. For these applications, Weatherlink provides a menu option to export any contiguous dataset in a standard text format for input to eg a spreadsheet program such as Excel. Weatherlink can also be set to generate certain text-format data files automatically, which – with some further programming – can be used as a direct source of the latest weather data by other programs. See our Advanced Topics area for a more detailed discussion. We’ve obviously used the Weatherlink software as the example of weather station software here. There is also a thriving after-market in third-party programs compatible with the Davis stations that offer even more features – sample output from some of these programs can be seen on the data-handling introductory page. But the Weatherlink software is what’s included free in the Weatherlink pack; it’s therefore typically the software that most users first encounter and also one that many users are perfectly happy with. Other makes of station will have their own proprietary software, usually each with their own quirks, and cheap stations will generally have only cheap and limited software. Linking the weather station to a PC brings one other key benefit in that all the technologies available in modern PCs and networks for moving data around, potentially over long distances, can be applied to the logged weather data. While the simple standard station + PC installation will be perfectly adequate for many users, those interested in a more advanced configuration may wish to read our separate summary review of additional data handling options. Some additional information on operation of the data logger will be found in the Advanced Topics area. For introductory purposes, we’ve assumed that the linked computer is a standard Windows PC since this is the commonest option; hence we use ‘PC’ as shorthand to refer to all types of computer. But stations can certainly be linked to other computer types, eg PCs running Linux or to Apple Macs, though at present the choice and capabilities of the available programs on other platforms are often limited compared to the equivalent Windows software. Purely for this reason we do suggest using a Windows PC if at all possible as the most straightforward option. Small and cheap Linux-based computers such as RaspberryPi and MeteoBridge are starting to be more widely used and can offer an interesting and cheap alternative way of running a weather PC, albeit with some important limitations.